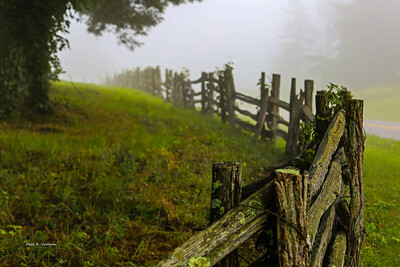 This old split rail fence that borders the Blue Ridge Parkway disappears "Into the Fog" on a misty day in the Blue Ridge Mountains. 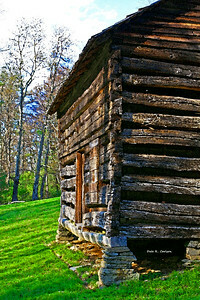 Sheet's Cabin at milepost 258.8 on the Blue Ridge Parkway is the oldest log cabin, built in 1815. 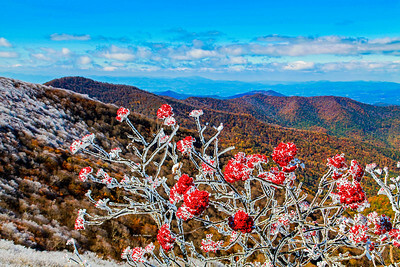 Moutain Ashe laced with rime ice at the Craggy Gardens overlook at milepost 364 on the Blue Ridge Parkway. 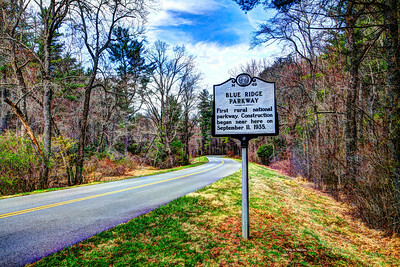 Where it all began on the Blue Ridge Parkway in 1935. Photo taken near Cumberland Knob at milepost 271.5. 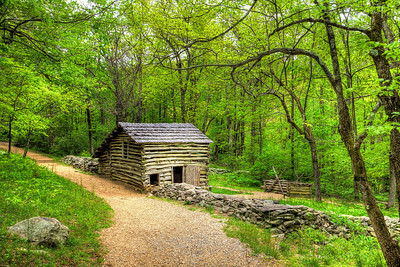 Puckett's cabin at milepost 190 on the Blue Ridge Parkway. 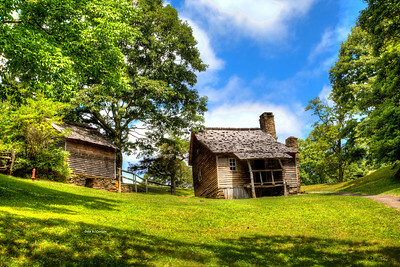 This was the last home of Orlean Hawks Puckett, a famous midwife in the Virginia mountains. She helped deliver over 1,000 babies, the last one at age 94. 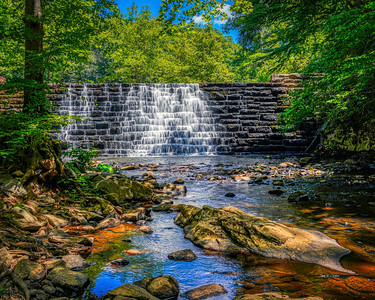 Otter Creek Dam at milepost 57.6 on the Blue Ridge Parkway in Virginia. 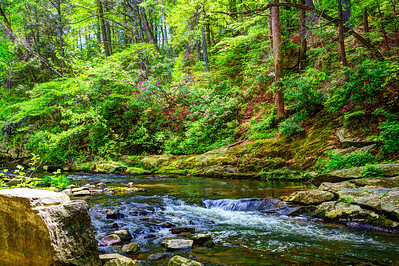 Catabwa rhodendrons blooming over the gently flowing Otter Creek just off of milepost 57.6 on the Blue Ridge Parkway in Virginia. 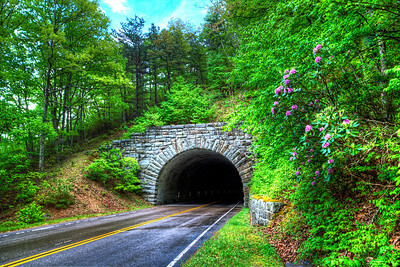 Catabwa rhodendrons blooming at the entrance to Bluff Mountain tunnel at milepost 53.1 on the Blue Ridge Parkway in Virginia. 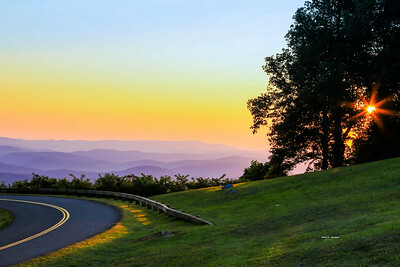 Take in the views on the Blue Ridge parkway at the "vista speed" of 45 mph! 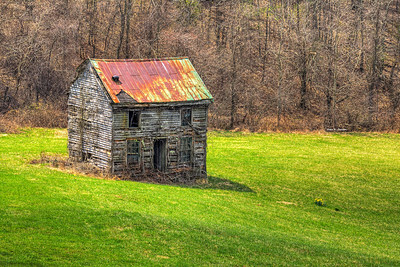 An abandoned homeplace just off the Blue Ridge Parkway north of Mayberry, Virginia (milepost 180). Even though the original residents are long gone, you can still see daffodils blooming in the field in front of the house! 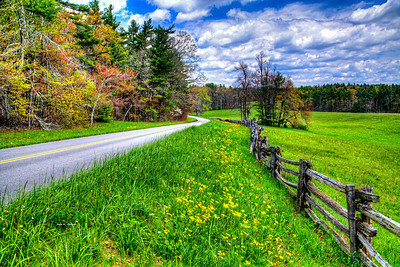 A spring view of the Blue Ridge Parkway just north of Glendale Springs, North Carolina. 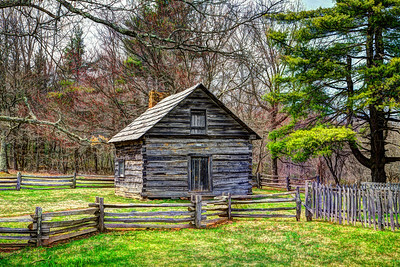 Brinegar Cabin at milepost 238 on the Blue Ridge Parkway in North Carolina. Martin and Caroline Brinegar built this cabin in the 1880s and lived there until 1935 when the Blue Ridge Parkway was built. A rustic log barn graced by spring leaves at the outdoor farm museum at Humpback Rocks at milepost 5.8 on the Blue Ridge Parkway. 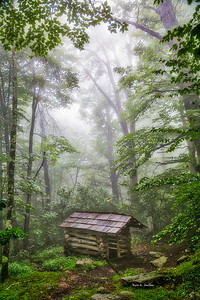 The Jesse Brown cabin shrouded in fog just off the Blue Ridge Parkway at milepost 272 in Ashe County, North Carolina. Once can imagine, back in the day, of traveling home after a long journey in weather like this and thinking, "Almost Home"! 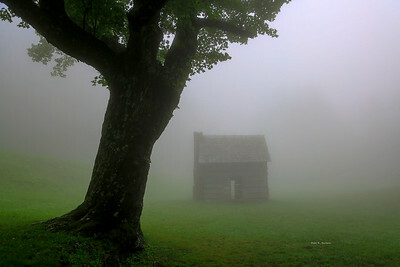 Fog enshrouds the spring house behind the Jesse Brown cabin at milepost 272 on the Blue Ridge Parkway in Ashe County, North Carolina. The sun peaks through the trees lighting the mountain vista at the Lump overlook on the Blue Ridge Parkway (milepost 264.4). 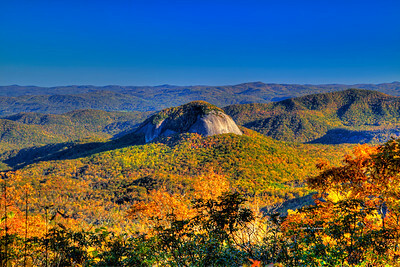 Fall leaf splendor surrounding Looking Glass Rock viewed from milepost 417 on the Blue Ridge Parkway. 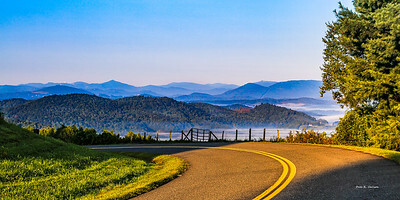 Fog in the mountain valley as seen from milepost 266.8 on a beautiful late summer morning on the Blue Ridge Parkway. The profile of Grandfather mountain can be seen in the distance in the very far left in this photo. 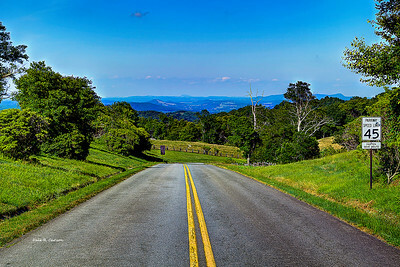 The vista from milepost 264.4 on a later summer morning on the Blue Ridge Parkway in Ashe County, North Carolina. View of Mount Jefferson in Ashe County, North Carolina from milepost 266.8 on the Blue Ridge Parkway. Mount Jefferson, with an elevation of 4660 feet, is the 5th highest peak in Ashe County. 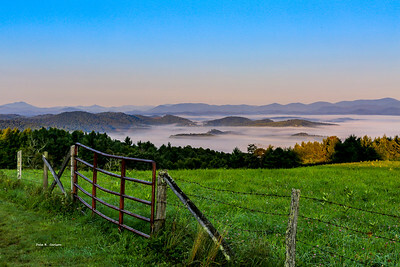 Photo taken on a late summer dawn with a layer of low-lying fog surrounding the mountain peaks. 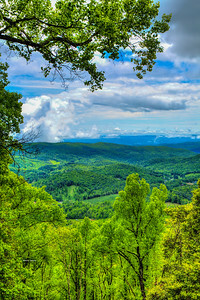 Spring greening of the mountains as viewed from the Stoney Fork overlook at milepost 277.3 on the Blue Ridge Parkway in North Carolina. 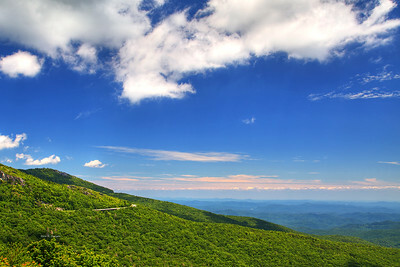 The long range mountain view from the Yonahlossee overlook at milepost 303.9 on the Blue Ridge Parkway in North Carolina. The views from the 4412 foot elevation at this overlook are breathtaking! 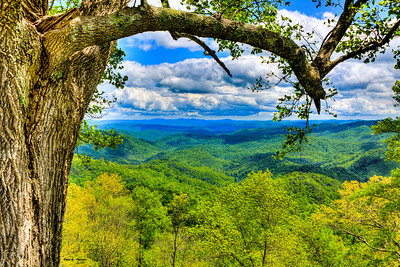 Vista of spring greening from the Grandview overlook (milepost 281.4) on the Blue Ridge Parkway in the mountains of North Carolina. 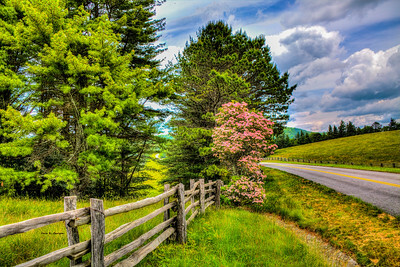 Mountain Laurel in full bloom graces milepost 245 on the Blue Ridge Parkway in North Carolina at the end of May.